Rather belatedly, I’d like to wish everyone a very Happy New Year! I do hope the holidays have been good for you and without too much disruption with the weather. 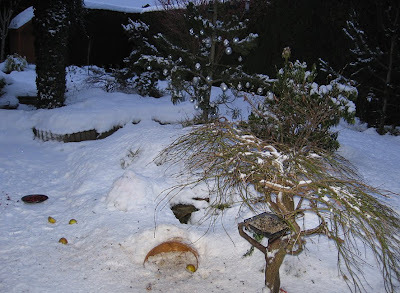 As you will see… snow is still covering my garden. 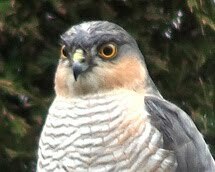 However, new visitors have found their way to my feeders which is making gardenwatching quite interesting now. 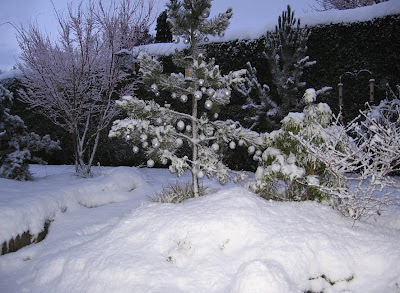 Since December 17th my garden and its plants have been under a thick blanket of snow. Cold temps have meant that mounds built up after clearing paths haven’t moved at all. There have been a few days where it looked like the snow might melt but then we’d get another very quick heavy snowfall and another layer was on top. 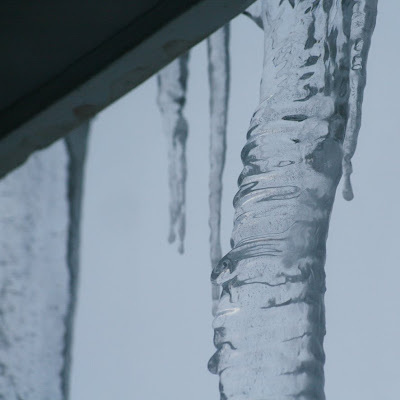 Some incredible icicles are still growing daily! With the angle of the ledge, window and stair it is impossible to show this as I see it but there are some close to 3ft long at the moment. There are still dramas in our cold winter garden as birds continually have disputes over the food available. All this squabbling, as you might expect, must be like a neon sign for predators. 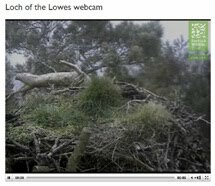 Damaged wings have been spotted too which could be narrow escapes from predators or fights with other birds over food. I hate to see birds hopping on one leg… especially in the cold. The other leg of the starling above was so twisted it must be broken. I was pleased it spent some time getting food at least. Some birds watched all the action like this female blackbird not knowing a robin was close by watching it! Looking across the snow, today I was able to sit by my window ‘gardenwatching’ for a while and saw a ‘first’ for the 4th of January! 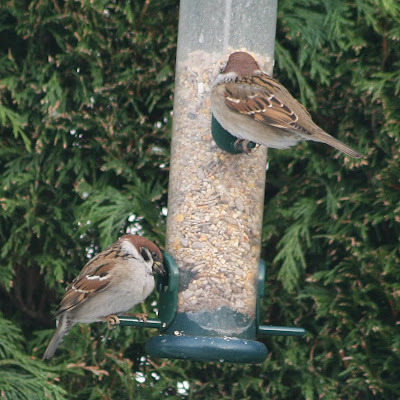 Today, I was thrilled to see (for the first time ever) two tree sparrows feeding on seed. Perhaps they have visited before but I have never noticed them. I always wondered if I’d be able to tell them apart the tree sparrow from the male house sparrows but they were quite distinctively different with their brown caps and black spots on their cheeks. The looked very smart with their white collars too! So that was the excitement in my garden for today… or was it? Light levels were low when I saw another return visitor for this cold time of year. I took a dull, grainy photo and was able to confirm its ID. However, when a very brief outing by the sun lit the branches of my neighbour’s cherry tree that overlooks my garden I had a much better photo opportunity. I wonder if you can recognise it from the angle below. 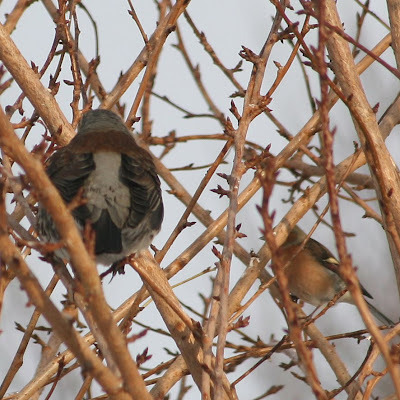 The male chaffinch on the right will give you an idea of scale. I was delighted to see this bird again and quickly/carefully ran out with an offering of red berries… cranberries that I had left over. My video camera was then set up to watch this dish of berries to see if this bird came down to feed on them. Alas… not today. Maybe tomorrow then… provided the snow doesn’t cover them overnight! Perhaps you’ve guessed the ID of this bird now. 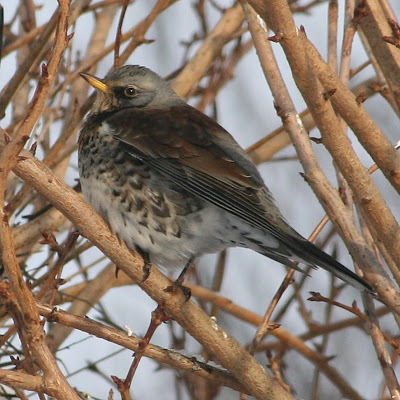 For those that haven’t or not likely to see this bird it is a member of the thrush family… a Fieldfare. I know my photos still aren’t perfect but considering they were taken through my window and at a distance I was absolutely thrilled with them!! They are so much better than the one I got last year so I am happy. I’d like to say that the photo below taken at minus -4 deg C, just before 4pm, today the 4th of January may be the last snow scene from my garden for the moment but alas the weather reports say otherwise! Brrrr… this cold spell and snow is to set to be with us for a few weeks more. Oh dear… I have a feeling I’ll have a few plant casualities by the time this frozen blanket leaves us. It’s been a good few years since a snowfall has covered the garden for so long. 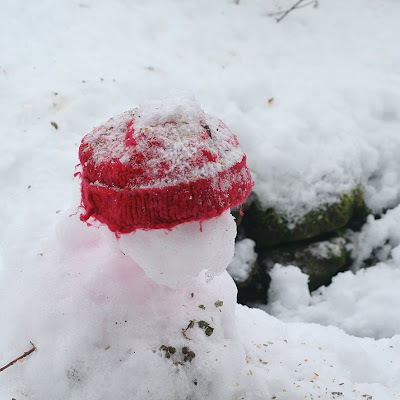 If you’ve got cold and snow with you, keep warm and stay safe when out and about. All photos above were taken in my garden. Most were taken on January 4th 2010 with others taken between 1st-3rd of Janauary. 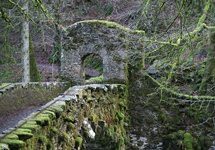 I came across your lovely blog while blog-hopping and must say what great photos. I do hope the snow clears for you soon. The Fieldfare is gorgeous -- reminds me of our Robins here. You have had plenty of snow by the look of it. Seems like hard work just keeping your drive clear. With that amount of snow over the plants it may keep the worst of the cold away from some of them. 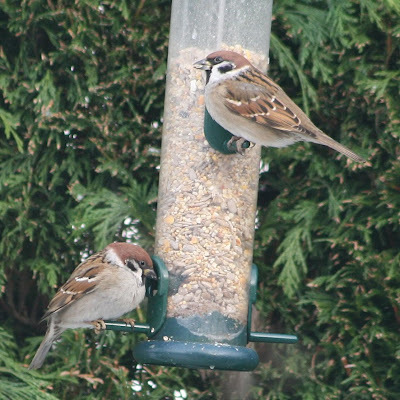 Great you got some visiting Tree Sparrows. They look so much neater than their scruffy looking House Sparrow relatives. 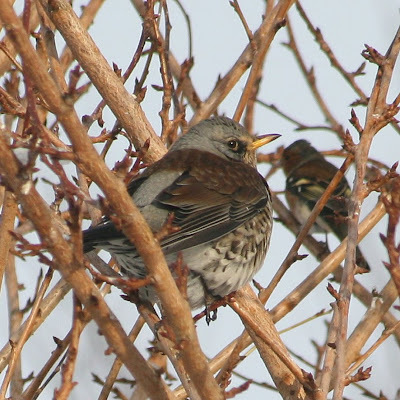 Lovely pictures of the Fieldfare. After yesterday's Redwing visitor today has been just the regulars here. Tree Sparrow and Fieldfare would be a mega garden tick down here. Waiting for a snow storm tonight so may have some WHITE pics to post sometime. FAB. That snow really is deep in your garden- and it looks as though it's going to take a good week at least to disappear, providing you get some warmer weather. It's snowing pretty heavily here at the moment too. I wonder if my school will be closed tomorrow. Great that you have two new visitors to your garden. 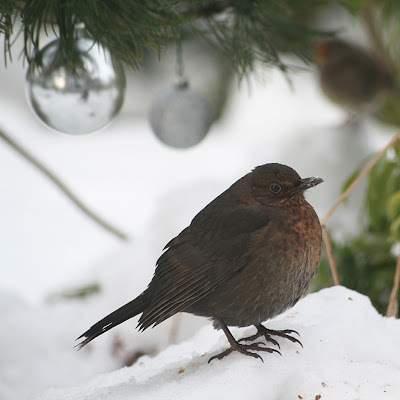 Its interesting... we have also had new visitors this winter, but we haven't seen a Fieldfare or a Tree Sparrow in our garden. Great photos of them too, it must be great to get some photos of less common birds which you can look back on. I saw a Brambling again yesterday, in our apricot tree. It really is hard to tell them apart from Chaffinches from a distance. I look forward to seeing more posts about your winter garden visitors. Happy new year to you too... and I hope that snow doesn't cause you any major troubles, as it is for many people. Your garden is lucky to have such a nice blanket of snow to keep the plants from freezing to death. 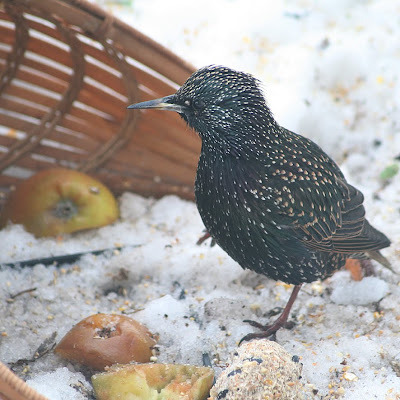 The birds are lucky to have you to keep them well fed during this severe winter. It is delightful to see all of your birds. Happy new year to you too, have to say I've had more than enough of the snow as well. Hi Shirl, Your bird photos are great - and easy to see that you have many birds that we do not have... and some of those that we do have (and are called by the same name) are very different! Have a great day. Stay warm!! Belated Happy Christmas and Happy New Year - I was thinking about you to-day as tonight is forecast to be -20 (in your neck of the woods) .... so I hope you stay toasty - its only -2 here - but I have brought my olive tree indoors, fingers crossed its not too late. Gosh. I'm fed up of the snow here after 3 days - I feel for you. How wonderful to see tree sparrows. And the fieldfare is gorgeous. Here's hoping for a thaw soon. We have a mistle thrush visiting our garden now. I think your photos are amazing considering they are taken through the glass. I don't have a single icicle......... yet! I will have loads of casualties but an excuse to buy something different later in the Spring. 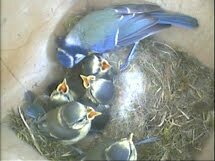 Lots of squabbles in our garden too over the food. Thanks for dropping in on my blog, I see you're a well established blogger, lovely photos , I'll be following your blog through this year. Having lived further North as I child I guess I look at times like this differently than those who have never experienced it down your way. There are many things I do ‘just in case’ we have spells of weather like this. For example, I always adjust my food shopping as the year turns so there is always plenty in the cupboard or freezer. 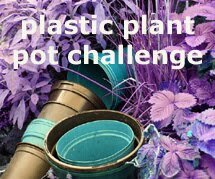 Yes, although I’ve stopped opening the curtains in the morning look for the snow to leave us, you are right, with the very cold temps we are having at the moment it must be protecting many of my plants. Hope the snow isn’t causing you too much trouble getting out and about. Hi again Joe, yep it has been and still with us. I see you have had some great photo opportunities with the snowfall in your garden not too. It is funny to see the Woodpigeons ‘lose their legs walking in the snow isn’t it? I’m guessing you have been off school. 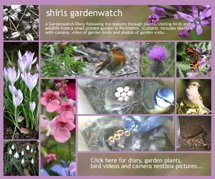 It will give you a great opportunity to watch the birds in your garden and catch video and photos. However, I see in the news today that some prelim exams have to be cancelled. Hope this doesn’t effect you. I’m guessing it might though. Lucky you seeing a Brambling… I don’t know what the chances are that one may find its way to my garden. I’d love to see one too. Re, Thank-you, yes even my daughter’s are saying they’ve had enough and the ‘snow’ word was banned when one was trying to make arrangements for a trip out on the roads! 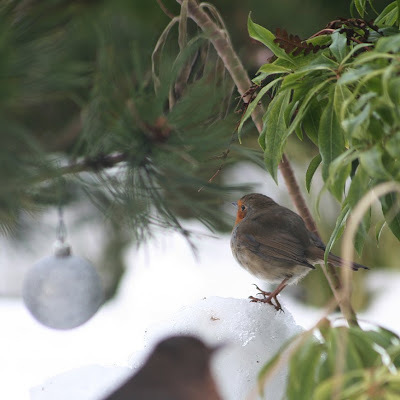 Unless I get some unexpected bird visitors today I plan to take my blog visitors on a day out… not a snowflake in sight! Call back later :-D BTW great info on feeding the birds on your blog!! 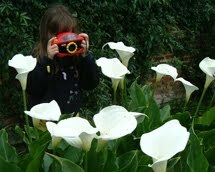 I enjoy your blog and in particular your photos. I love the fact that so many of us are feeding the birds particularly in this very cold weather. I also have some red squirrels who daily visit the bird feeders. 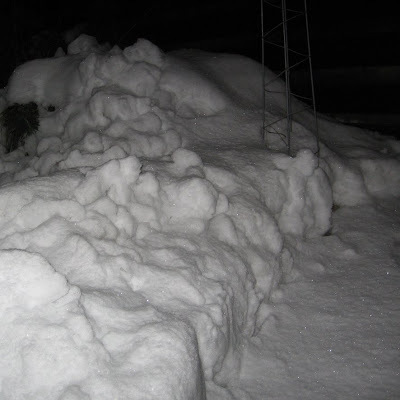 You seem to have more snow than here in the west, but the ice has stopped my car getting out for three weeks now. I don't seem to walk any more - I just shuffle and it is an expedition to go and feed hens and ducks. As for taking dogs for a walk!!!!! Keep up the good work and keep warm. Wonderful post Shirl! I love all your birds and your photos are fabulous! You can get so close it seems. They must know and trust you. I hope you will not have damage from this cold and heavy snow. Happy New Year to you Shirl!